This is the first of a few blogs that I will write about asset bubbles and modern monetary theory (MMT). The point came up this week in a comment posted by Sean Carmody in response to my blog – Operational design arising from modern monetary theory. It was also raised in the current debate about MMT and debt-deflation, which I will return to on Sunday. The proposition is that if the the central bank maintains a zero target interest rate then lending rates will be so low that there will uncontrollable asset bubbles. As long as fiscal policy is used sensibly I disagree that a zero interest rate policy is destabilising. * Side-stepping the “natural” label for interest rates for the moment, you argue that having a cash rate at 0% would be very beneficial. Would that not lead to bubbles in financial assets (shares, property prices, etc), which can be very destructive when they burst? … I love it Professor Mitchell as we are so close to saying ‘No need for a central bank’. In all honesty good luck with it and I’m sure many will be looking out for the follow-up article on how to stop asset bubbles even though lending rate wont be zero. As an aside the central bank is still needed to manage the payments system and ensure the overnight rate remains at zero. It might at very odd times allow the overnight rate to rise above this. But in general, most of the central bank staff should be diverted into other more productive activities (that is an opinion not an intrinsic finding from MMT). But lets return to the asset bubble issue and in this blog I just concentrate on property prices. To motivate the discussion I refer to an interesting article in the Melbourne Age yesterday (October 1, 2009) entitled No place to call home, which was reporting on research from the BSL and Australian Housing and Urban Research Institute (AHURI). Tax concessions to the wealthy are pricing others out of the property market. Household 1: an unemployed middle-aged man co-renting with four co-tenants in the suburbs – paying $175 per week for rent and utilities for an unfurnished room. He has $14.30 a day left from his unemployment benefit for all other expenses. Household 2: a middle-income family (2 adults in their mid-30s and two primary-school-aged children) – they are unable to purchase a house due to high prices. Household 3: a retired professional couple – bought in inner suburbs when housing was cheap and to have both a good accountant and a good eye for real estate bargains. They are doing very well. … the tax system provides indirect assistance to owner-occupiers worth $45 billion annually – $30 billion of this is due to the exemption from capital gains tax of owner-occupied homes, with a highly disproportionate amount of benefit going to older and wealthier Australians. This is hurting all of us by pushing up property prices for investors, middle-income families and the poor. 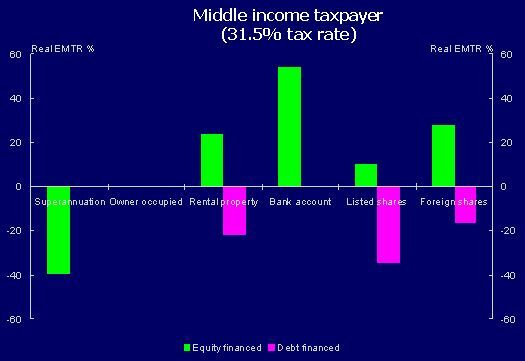 Rental properties, however, face different effective tax rates depending on the financing choice of the saver – a low positive effective tax rate when equity financed but a negative effective tax rate when geared. The tax treatment of a negatively geared property would typically involve the taxation of rental income and the deduction of interest and other expenses at the full personal marginal rate, with capital gains taxed at a half rate due to the capital gains tax discount. This throws up a significant asymmetry. It has long been the case that so-called negative gearing distorts the housing market and inflates asset prices. Those with high incomes can gain very significant tax concesssions by purchasing several investment properties and running them at a loss (thereby reducing their current taxable income) and then, eventually, cashing in on the capital gain sometime in the future. Win-win. The other source of housing price inflation is the first-home buyer grant which while good intentioned merely capitalised the subsidy into the price on offer. In just the same way that subsidies for rainwater tanks have been capitalised into the starting price of tanks. If you want to help people at the lower end of the housing market you need a “non-market system of provision”. See below for a brief comment on a publicly-run and provided “low-income housing fund”. The BSL-AHURI Report argues that: (a) Federal capital gains tax exemptions should “be phased out on homes worth more than $1.1 million” which would impact on only 2 per cent of all owners; and (b) State/territory governments should “remove the exemption from land tax of very expensive owner-occupied dwellings while removing or reducing stamp duty on lower-priced homes”. At the state government level the revenue gained from this could be used to dramatically increase the social housing stock. This is interesting because it has long been argued that if the negative gearing exemptions were abandoned (as they were in the 1980s). There is a tremendously strong real estate and housing developer lobby in Australia who cannot see beyond their vested interests. Here is an example. In 2007, the Property Council of Australia, who amuse me everytime I see their logo which says – The Voice of Leadership, said this in relation to the deteriorating housing affordability crisis in Australia. One suggestion which continues to be a focus of attention is the idea that negative gearing should be abolished. The argument goes something like this: negative gearing allows investors to offset the losses made on investment properties against other forms of income, thus lowering taxes … This makes investment properties sought after and, because of demand, raises prices. So, it is thought, eliminating negative gearing will keep home prices from rising. In reality, there would be far less rental property available if it weren’t for this provision because the investment property would become less attractive relative to other investment opportunities … Those without the resources to buy would simply suffer, those who could buy, would, replacing the demand gap left by investors and so keep demand (and price) from falling. They went on to say that “‘negative gearing” is ‘negative’ … [because to get the tax benefit] … the investor must make a loss on the investment property”. First, if you eliminate the tax gains via negative gearing and force the investors to bear all the costs then the assessment of capital gains become more intense and important. If you, in turn, tax the capital gain more rigorously then you can mostly eliminate the speculative market for housing. People will still compete for the scarce assets but within a much different costs and benefits environment which would put a brake on the speculative excesses (for example, owning multiple properties). Second, a crucial point about the arguments surrounding rental property availability, is that they usually ignore the provision of public housing and never consider the obvious solution for low-income earners – a publicly-provided fund for house purchase. Public housing has been subjected to the neo-liberal attacks on government spending over the last 20 years or so and waiting lists remain very high. There is a huge shortage of low-end housing stock in Australia as a result. The data on public housing in different countries is not easy to acquire. So at present I am looking only at Australia. As an aside, I have just finished (in my spare time) watching the first four series of The Wire, which focuses, in part, on public housing in Baltimore. I am planning to write about the series which is one of my favourites of all time. From further research you get the feeling that public housing provision in the US is worse than here. But further research is being done. According to the Commonwealth State Housing Agreement national data published by the Australian Institute of Health and Welfare (latest report covers 2007-08 and published January 2009), there were around 389,000 social housing dwellings in Australia. Social housing includes public housing, government-owned and managed Indigenous housing, public-subsidised community housing and various types of crisis accommodation. The following graph shows the movements in public housing provision and the unsatisfied demand since 2001. 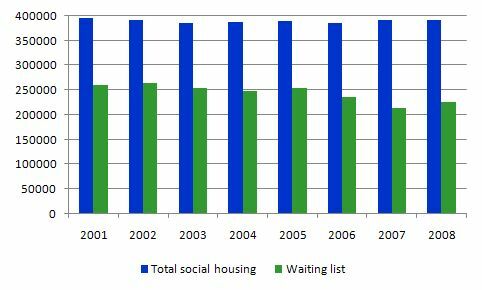 Over the last decade the number of people waiting for social housing has fallen (by around 13 per cent) but this isn’t necessarily a sign of things being good because the major reason for the fall has been the more strict eligibility criteria and harsher reviews of status. The latest data says that there are still more than 225,000 people waiting for social housing in Australia. By far the largest component of social housing (around 85 per cent) is public housing. 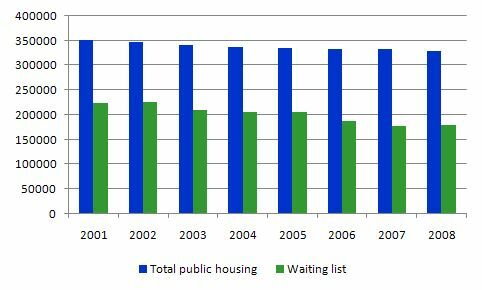 The following graph shows the total stock of public housing and the attendent waiting lists since 2001. Over the last decade or so there has been around a 5 per cent drop in the provision of public housing as governments have adopted neo-liberal strategies to force more private ownership/rental. As at 2007-08 (latest estimates) there were 178,000 people waiting for public housing and the delays can be years. Again housing authorities have toughed eligibility criteria and reviewed the status of many residents deeming them no longer eligible. This has reduced the waiting lists by around 16 per cent but only by reducing demand. I consider that the housing problems have been seriously exacerbated by the poor design and implementation of fiscal policy in Australia. In that regard, I believe an appropriately designed taxation system with targetted policies to stop housing speculation would be far more efficient at controlling asset price bubbles than using the blunt end of monetary policy. Monetary policy is a very inefficient policy tool. It cannot discriminate across regional space. We have seen that in recent decades a booming capital city can be accompanied by stagnant regional and remote economies. And the considerable regional disparities in economic performances have persisted even during the growth spurt. In cases like this, when, say a major city (for example, Sydney) is booming and housing prices are escalating, increasing interest rates impacts severely on the stagnant areas of the country. This would not be the case using a well-targetted fiscal instrument – mostly in the form of specific taxation measures that can discriminate by region and demographic-income-property cohorts. You can never get that richness in policy design using monetary policy. Further, if public housing is considered undesirable as a solution the federal government (with some constitutional reforms) could set up a fund to allow access to cheap mortgage instruments to low-income families and allow them to purchase housing (publicly- or privately-provided) with minimal distortion to the price distribution. MMT tells us that the federal government can always afford to do this. What would happen if the property market didn’t have fiscal distortions pushing up prices? One good test of what happens to real estate prices when you have zero interest rates is to consult my highly non-linear, dynamic, completely-specified, stock-flow consistent macroeconomic model which I call Japan. It is hard to get housing price statistics for Japan but the Real Estate Institute of Japan publishes very useful time series for Urban land prices, Index, which are highly correlated with dwelling prices. If the land prices are going up then so will housing prices. 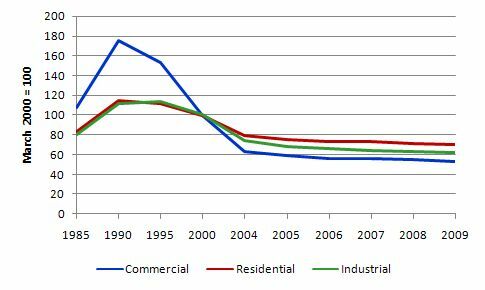 The following graph shows the evolution of urban land prices for Commercial, Residential and Industrial for selected intervals from 1985. You can see the huge asset price bubble in the late 1980s that precipitated its “lost decade” and plunging land values. The Japanese government addressed the stagnation by significantly increasing its net spending and public debt rose (given they voluntarily issue debt more or less in line with net spending – with the exception noted below). They clearly do not have to do that given they are not revenue constrained. Once the budget deficits started to get demand and output growth going again the government was placed under significant political pressure to contract fiscal policy. The result was a double-dip recession in the late 1990s prolonging their recovery. They then resumed their stimulus strategy and growth returned – you can read about these trends in this blog – The impact of government on reserve dynamics … . Now, compare the land valuation time series with the following graph which shows the Bank of Japan target rate more or less over the same period. 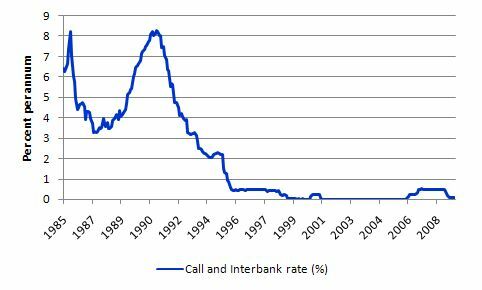 This graph shows the evolution of the call rate (the BOJ target rate) which was also kept the interbank rate in lock step. The Bank of Japan deliberately allowed excess reserves added by the budget deficits to remain in the banking system. They did this by not issuing enough debt to drain all the excess reserves (created by the deficits) and let the interbank market compete the rate each day down to zero. The central bank managers clearly understand how a fiat monetary system works – that is, along the lines of MMT. So we have had many years of zero interest rates in Japan. At times, they experienced shocking real GDP growth while at other times, buttressed by strong fiscal policy they enjoyed reasonable real GDP growth over the same period. But there was no asset price boom resulting. As part of the MMT approach to monetary and fiscal policy we are developing some operational guidelines for banks and banking regulation to accompany those I have already discussed in this blog – Operational design arising from modern monetary theory . I intend to write a separate blog on this as I work out a more comprehensive framework, but here are some introductory ideas. These would supplement the fiscal policy approaches I noted above to maintain control of housing prices. The only useful thing a bank should do is to faciliate a payments system and provide loans to credit-worthy customers. Attention should always be focused on what is a reasonable credit risk. In that regard, here is a sketch of what I would do with the commercial banks by way of regulation. First, they should only be permitted to lend directly to borrowers. All loans would have to be shown and kept on their balance sheets. This would stop all third-party commission deals which might involve banks acting as “brokers” and on-selling loans or other financial assets for profit. It is in this area of banking that the current financial crisis has emerged and it is costly and difficult to regulate. Banks should go back to what they were. There is also some more detail we are discussing about whether banks should be allowed to contract in foreign interest rates. There is no public sense in them being allowed to do this but I am still working it out. I don’t see a zero interest rate policy which will keep lending rates down as being an open door for a credit binge if fiscal policy is correctly designed and targetted and the banks are regulated properly. Tomorrow is the Saturday Quiz and Sunday I will round up the debate unless something else takes my interest. Can we really infer from that whether the lack of an asset boom is as you say a validation of MMT, or whether the lack of a boom is due to other factors, in particular the ongoing deflationary impact of the demographic situation. Were this policy tried in oz tody with its much younger demographics (with perhaps another 5-10 years to go before the oz pop pyramid looks like that of the US right now), why would the outcome be the same? That is, why would the outcome be independant of aggregate demand and supply for housing? I do think you can have strong GDP growth as in japan, yet at the same time have depressed housing demand. Also I’m given to understand that in japan housing is still very expensive compared to income. How does MMT reconcile all this? I actually didn’t say the asset price boom was a validation of MMT. I am not Popperian in my approach to knowledge. But what the facts do say is that a zero interest rate held for year does not inevitably associate with a land price bubble. Japan may be a special case because of demographics, religion, history. But you have to make the case that it is. But the point of the blog is that the government has all the tools it needs to fight specific asset price pressures and they do not include monetary policy. So I am not advocating zero interest rates without a suite of fiscal policy and financial regulation initiatives also put in place. The level of housing prices is irrelevant when talking about asset price bubbles. I do agree that zirp doesn’t create asset bubbles as long as suitable regulation is in place. Regarding japan perhaps the point is that firstly, they didn’t need too much regulation in this area as a result of lack of house ownership demand. Secondly, while they have certainly had large public spending it seems to me that their ability to continue exporting due to robust overseas demand has to some extent meant that they have been able to retain a larger private sector that we might expect to be the case for the other western economies in the same circumstances (and also japan in future assuming global demand for their exports remains low). This in turn means that the job of decising on how to allocate fiscal spending has been more tractable than it is likely to be in future for them, or us. All in all, we can certainly say that zirp has not resulted in japanese asset bubbles, but I’m not sure that tells us much about whether that is due to effective regulation or not, or what the difficulties or challenges may arise in designing suitable regs. We can also note that the yen carry trade has created asset bubbles everywhere except japan – but I guess this issue is related to your final point about international banking. I’ll be very interested to see what you come up with here. On one more unrelated note, I wonder whether the JG concept begins to run into trouble when the economy begins to approach the point at which it is 50% public. At this point, the JG, a public operation, is mostly competing with the alpha public sector. This seems to me to be some limit condition for the JG as a stabilising economic force, and that market adjustment of both the JG wage and alpha sector wage is going to become increasingly unreliable the closer to the 50% point one moves. You are crazy productive. I visited your favorite productivity blog. Didn’t help. How do you do it? Thanks for all your detailed posts… I am still working through them but find the theories you describe intriguing. Your arguments are always very detailed so whenever you can include summaries at the beginning or end of the posts it is very helpful to someone like me still getting up to speed with the theory! “As long as fiscal policy is used sensibly I disagree that a zero interest rate policy is destabilising. So we have had many years of zero interest rates in Japan…. But there was no asset price boom resulting. I know you said this is the first of a few blog posts on asset price bubbles, so you’ll probably get to all this, but in case not, I do have questions along the lines of scepticus’s. It does seem to me that Japan during its private sector deleveraging phase does not provide any evidence either for or against the points you make here. Some would argue that low interest rates can amplify bubbles when the economy is experiencing the self-reinforcing speculative euphoria described by Minsky, but are not sufficient to create bubbles under all circumstances. In the same way, badly designed fiscal policy and regulation seem likely to amplify bubbles, and well designed policy to dampen but not entirely prevent them. Perhaps you disagree. Here is a graph of US federal funds rate versus total bank credit growth since 2000 that suggests a correlation, though private credit expansion clearly keeps going even after rates are raised due to the reality of loans creating deposits rather than vica versa. This chart shows Japan’s private sector reducing nominal debt levels after 1997 despite low nominal interest rates, since the economy was still suffering from the effects of bursting asset bubbles and damaged balance sheets. If you have time to look at how that graph of Japan’s debt data is derived here I’d be curious if you consider it validly sourced… and if so perhaps you’ll find it helpful since you have used Japan as an example multiple times. Incidentally, do you have any way of estimating what lower level of bond issuance the government of Japan could have gotten away with without creating undesirable levels of inflation? (Since by issuing so many JGBs, their total debt-to-GDP level kept expanding through 2005). Again I’m not saying anything that invalidates your points here, just questioning post-1990 Japan as evidence, and I look forward to seeing you explain the theories and evidence further in future posts. hbl, that’s great data, thanks for sharing it. I have been searchnig for reliable data on japan and it is hard to come by. I’ll be interested to read bills’ feedback on it. It would seem to me that if the private sector had no use for such an enormous portion of the labour force, then the private sector would already be in serious trouble. What factors would cause it to reject half or a quater of the willing workforce? If the minimum wage and condition job gaurantee was absorbing such a percentage of the nations workers, then it would seem to me that the private sector would be experiencing something akin to a great depression style event. In which case we would probably be screwed without the job gaurantee. It doesn’t take zero (or even merely low) interest rates to have asset prices inflate, contrary to monetarist theory. By comparison with Japan 1990-present and U.S. 2001-present, the interest rates in the U.S. during the 1980’s were very, very high. Yet, during this period there were bubbles and crashes in commercial real estate, equities, and junk bonds. Historically, the causitive factors in credit and asset bubbles are independent of interest rates and directly emerge from expansion of various forms of “financial innovation” that range from techniques to maximize leverage and extend ever-riskier loans to garbage bookeeping to implicit and explicit fraud. When they’re all occuring at high speed and volume at once, as in the last decade, the expansion is dizzying and the crash horrifying. While it’s comforting to think that the right form of regulation of banks and all the other financial participants would be the correct way to control such “financial innovation” and its associated asset bubbles, Minsky examined all this decades ago and correctly noted that the innovators will always get around the regulators one way or another – that’s what makes them so innovative. I do agree with your proposal, which parallels Minsky’s, that the absolutely primordial regulation – of you’re going to bother with any – must be to get the banks out of any and all activities other than taking deposits and making face-to-face loans which they keep on their own books. If you could get the pols to successfully enforce that one, at least our core financial systems could sit out the “financial innovation” orgies and have a chance to avoid implosion during the crashes. Been away for a few days, so just seeing all this. Michael makes many of the points I would make. Indeed, instead of finding all the ways that Japan does not provide a good case study of the effectiveness of a permanent ZIRP not leading to asset price bubbles. look at the history of asset price bubbles and you will find overwhelming evidence that the level of interest rates were not the operative factor. Indeed, the common denominator is speculative behavior (probably by definition), for which a few percentage point difference, or 5 or 10, in the interest rate generally won’t matter. A few other points . . .
1. Michael . . you may be interested in Eric Tymoigne’s recent book, “Central Banking, Asset Prices, and Financial Fragility,” in which he strongly recommends regulating innovations. Tymoigne, a student of Wray (who was a student of Minsky), is similarly under no illusions that there is any “one best” or “perfect” way to control asset price bubbles for all time. 2. Often forgotten in this ZIRP debate regarding Chartalism is that the Chartalist proposal is to set the overnight risk-free rate at zero, NOT the rates at which those speculating in the middle of an asset-price bubble would be borrowing. Indeed, part of the problem with existing regulatory regimes is they reinforce the countercyclical nature of credit-risk spreads above default risk-free rates. As I believe has been noted already here, adjusting the overnight rate target is a particularly blunt (and often counter-productive) way of dealing with this problem.